As fall starts to get crisp, our local farmers market gets smaller. Soon it’ll move inside. For now it’s full of vendors with winter lettuces, beets, last minute peppers, pumpkins, turnips and my favorite, radishes. Radishes grow all summer and fall long in MA and this summer I happened upon the watermelon radish. A delightful large white radish with a brilliant pink center. The perfect summer looking vegetable. I served it raw on salads, fish tacos and boiled on sandwiches. I was surprised when this summer looking vegetable was found at the fall farmers market and I knew I had to preserve this piece of summer. 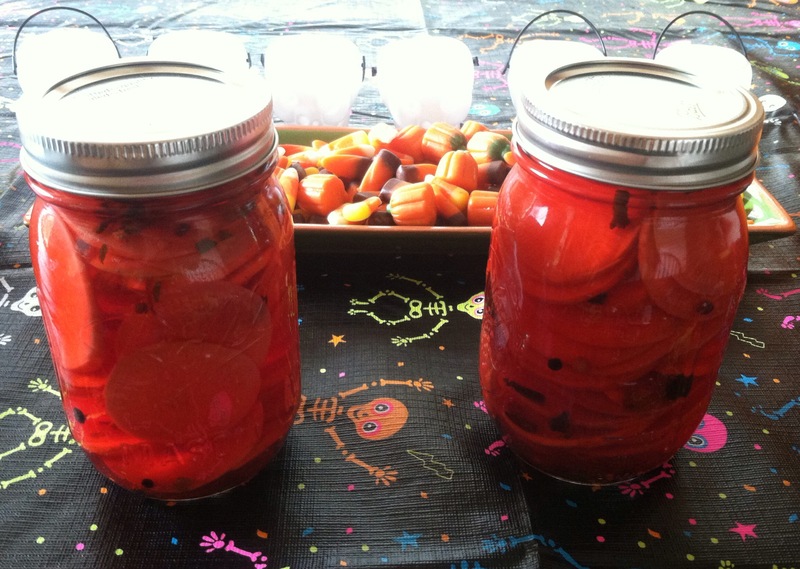 Pickling is my new jamming (for those of you that know me). I thought this wonderful, refreshingly crisp veggie could be preserved and brought out during the dark snowy months as a reminder that warmer (brighter) things are coming. Slice radishes and divide equally between two jars. Add 2 peeled garlic cloves to each jar. Add juniper, cardamom and pickling spices. I tend to mix my spices together and layer with the radishes for presentation sake, but it doesn’t matter how you do it in terms of flavor. In a medium saucepan bring vinegars and salt to a boil. Boil for 5 minutes then turn off heat and stir in oil. Let come to room temperature and then pour over radishes. Seal jars and turn upside down for a tighter seal. That’s it! These should last a couple months in the pantry provided you got a good seal and 4 months in the fridge.